As part of the South Beach Diet, a low-carbohydrate plan, you will begin with phase one and move through phases two and three on your weight loss journey. In the first two phases, the plan has a stringent list of allowed foods and foods you must avoid, and this is particularly true for the first phase. Each allowed food has a recommended serving size, and some foods require portion control as well. This diet plan allows you to consume as much lean protein as you need to abate your hunger. To avoid overeating, begin with a small protein portion and return for an additional serving if you still feel hungry. The South Beach Diet recommends starting with a 2 oz. protein serving for breakfast and a 3 oz. serving for lunch and dinner. You might find the serving size of some soy products easier to measure with a measuring cup. For example, the South Beach Diet recommends a half cup of tofu for a serving size. You also can begin a meal with a quarter cup of soy crumbles or tempeh. You can eat an unlimited amount of eggs, egg whites or egg substitutes each day, but if you have high cholesterol or other health conditions, your doctor might advise that you limit your egg consumption. You can have up to 2 cups of low-fat milk or yogurt each day. If you have fat-free evaporated milk or half and half, you can only have 2 tbsp. each day. You may choose to spread this out over three meals and a snack, having a half cup of a dairy product each time you eat. You also may choose to consume the full amount in one meal. If you eat cheese, you can have as much low-fat varieties as you need to reduce your hunger. Make sure the cheese contains 6 g or less of fat per ounce to ensure that you consume low-fat options. Some varieties include low-fat cottage cheese, part-skim ricotta and mozzarella. You can have one serving of beans each day, with the portion size ranging from a third to a half cup. However, if you follow a vegetarian diet, the South Beach plan allows you to eat additional servings of beans to help you meet your nutritional requirements for protein and other nutrients. Some options include black beans, butter beans and lima beans. The South Beach Diet allows you to eat 2 tbsp. of hummus, a blended spread often made from garbanzo beans, olive oil and seasonings. The first phase of the diet does not allow you to consume any fruit, and you also should avoid certain vegetables, such as carrots, potatoes, corn and pumpkin. Other than the disallowed items, you can have as many servings of vegetables as you like each day, but you should eat at least 2 cups with your lunch and 2 cups with your dinner. Your options include cabbage, broccoli, spinach and green beans. You can have one serving of nuts and seeds per day. 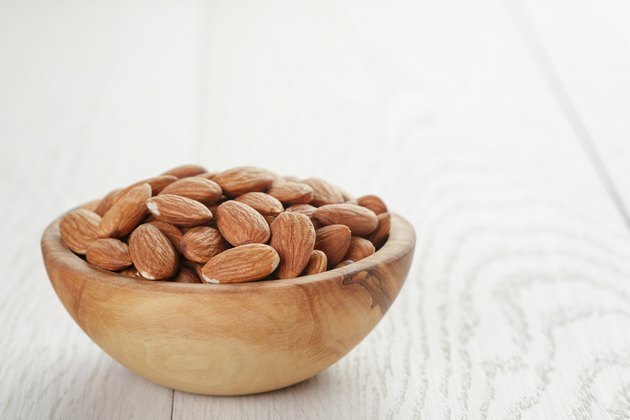 You can have almonds, cashews, pecans and walnuts, but you must limit your portion to 15 nuts. You may have four Brazil nuts, six chestnuts or eight macadamia nuts, or you may choose to have 3 tbsp. of sunflower, sesame or pumpkin seeds. Can I Eat Beans on South Beach Phase One?